Here is a nice little treat from Hawkwind. Imagine, Instead of being bludgeoned to death with 3 Hawkwind double albums in 3 years of varying quality – Blood Of The Earth (2010), Onward (2012), Stellar Variations (2012) – as well as a nice solo effort from Dave, Looking For Love In The Lost Land Of Dreams (2012), we get “the Best Of” this decade’s “three years on” summary of Hawk-activity on one disc from those four records, with several unheard studio and live tracks from this era, as well as remixes of tracks from those albums mentioned. Tracks from Warrior On The Edge Of Time (1975) are re-recorded by the current line up. Assault & Battery / Golden Void and Demented Man, and both are excellent. From In Search Of Space we get the Dave Brock solo-reworking of We Took The Wrong Step, from the Looking For Love In The Lost Land Of Dreams CD/LP, and Master Of The Universe, as well as a nightmarishly spoken Sonic Attack, all vintage EMI-era Hawkwind songs from the first half of the 70’s. 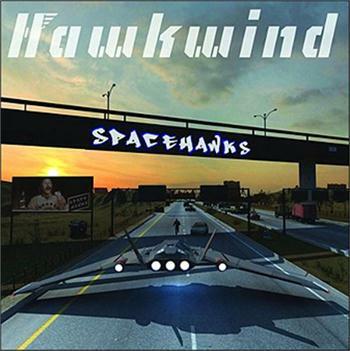 Fan reaction has been generally positive, comparing “Spacehawks” to a latter day “Out & Intake” mayhap, or a “tour companion” CD for the botched US tour of Hawkwind playing the entire Warrior album for the Hawk-starved Americans over the pond. There are new tracks as well, like We Two Are One, Sacrosanct and Touch. There is little fat to trim on this collection, as it is thoughtfully compiled, so just imagine that… We get a remix of the vinyl only track from the Blood Of The Earth LP, the exclusive song Sunship, we get It’s All Lies from the Stellar Variations LP/CD, as well as a remix of Sentinel and Seasons from last year’s Onward LP/CD. The core of Hawkwind old timers Dave Brock, Tim Blake, and Richard Chadwick are well augmented by more recent Space Cadets Mr. Dibs and Niall Hone, and Inner City Unit man Dead Fred on violin. It seems Hawkwind love the compilation format when it is geniune and not some sort of ripoff operation for fans and band alike, like all those dodgy comps we have seen in the past with the same stuff over and over again. Here we get some fresh stuff, remixes and rare tracks as well as reinterpreted 40 years on versions. It’s a lovely little record I recommend to all Hawkfans old and new, it is a treasure for old fans and might very well be a fine introduction to the band for those who never heard Hawkwind. It is also also availible on LP. Set forth and procure this item, as you most likely will not be panicking as it IS Hawkwind! It’s a 69 minute Hawk-conniseur tour de force. Achtung! Blast off into 2014 with the mighty “Spacehawks”!